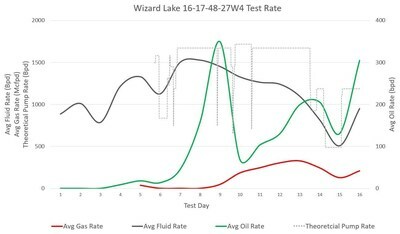 CALGARY, Jan. 21, 2019 /CNW/ – Point Loma Resources Ltd. (TSX VENTURE: PLX) (the “Corporation” or “Point Loma“) is pleased to announce production test results for the Wizard Lake HZ 16-17-48-27W4 Rex oil pool discovery. Final pumping rate for the Rex horizontal well over last 24 hours of the test period was 305 barrels per day (bpd) of oil (17 API) and 340 barrels of oil equivalent per day (boe/d) (Figure 1). Point Loma’s share of oil production at this rate would increase corporate oil production in excess of 100%. Figure 1 below illustrates generally increasing rates during the test. The Corporation determined that commercial production has been established and has ended the test period. The well recovered all load fluid during the test and ultimately recovered an additional 3,178 barrels of fluid of which 1,847 barrels were oil for total fluid produced during the test of 18,829 barrels. Point Loma has a 70% working interest in the lands associated with the well. Point Loma and partner Salt Bush Energy Ltd. (“Salt Bush”) control 3,385 acres gross and 2,370 acres net in the area. Plans are underway to tie-in and conserve solution gas associated with the well and install production facilities. Subject to regulatory approvals the well is anticipated to be placed on production in second quarter of 2019. The test commenced December 24, 2018 and was conducted with a submersible pump to temporary production testing facilities. The test was interrupted December 30, 2018 to January 4, 2019 due to downhole pumping issues. From January 4, 2019 until January 15, 2019 the well was pumped continuously with pumping rates varying at times as illustrated in Figure 1 above. The well displayed excellent inflow with total fluid rates averaging 1,123 bpd during the testing period. All load fluid was recovered during the test period and an additional 3,178 barrels of fluid of which 1,847 barrels of oil were recovered beyond the original load fluid. Oil cuts were trending upward through the continuous flow period and indicate potential for further increases in oil rates upon commencement of full time production. The final test rate is above average expectations of the Corporation and would increase Point Loma’s oil production in excess of 100% (Current approximately 145 bopd, potential increase with test rate to 300-350 bpd net). Next steps to advance the Rex oil pool will be to tie-in the solution gas to a nearby gas processing facility and install a single well battery. Work related to these activities is already underway. Current landholding of the Corporation support the potential for 10-14 (gross) additional drilling opportunities based on internal mapping and projected well spacing. Point Loma plans to release its updated year end reserves in the coming weeks and looks forward to taking further steps to unlock additional value for shareholders on this exciting new oil play. The Wizard Lake Rex well was spudded on November 24, 2018 and rig released December 2, 2018 (nine days inclusive). The well intersected a continuous Rex reservoir section from the casing shoe to the toe with predominately good quality reservoir accompanied by excellent oil shows (fluorescence and cut) and elevated gas readings. Following a 28 stage fracture stimulation program, the well commenced a cleanup test on December 24, 2018. The Rex target at Wizard Lake is the first horizontal well to be drilled in what could be a multi-well program analogous to the offsetting Leduc area Rex development. Recent activity in the area has resulted in highly commercial wells (250-300 boepd, 80% oil, 16-17 API). The target zone in the Corporation’s lands has similar porosity but is thicker than at the Leduc area. Recent area offsets have been drilled to lateral horizontal lengths of approximately1800m versus the Wizard Lake HZ 16-17-48-24W4 at approximately 1200m lateral length which further illustrates the superior reservoir quality of the Point Loma discovery. Point Loma maintains an extensive inventory of additional opportunities identified in similar fashion through analysis of historical penetrations on the lands that are indicative of bypassed oil pay. A description of the Corporation’s other top tier opportunities can be found in the corporate presentation on the Point Loma website at www.pointloma.ca . Point Loma is a public oil and gas exploration and development company focused on conventional and unconventional oil and gas reservoirs in west central Alberta. The Corporation controls over 160,000 net acres (250 net sections) and has a deep inventory of oil opportunities in the Mannville (Upper and Lower), Banff, Nordegg, and Duvernay Shale formations. Point Loma’s business plan is to utilize its experience to drill, develop and acquire accretive assets with potential to employ horizontal multi-stage frac technology and to exploit opportunities for secondary recovery. For more information, please visit Point Loma’s website at www.pointloma.ca or Point Loma’s profile on the System for Electronic Document Analysis and Retrieval website at www.sedar.com. This press release contains forward-looking statements and forward-looking information within the meaning of applicable securities laws, including without limitation, statements pertaining to expectations as to production and future potential production increases; the expected timing of tie-ins and the installation of production facilities; additional drilling opportunities identified by the Corporation; and the focus of Point Loma’s management team and go-forward strategy. Since forward-looking statements and information address future events and conditions, by their very nature they involve inherent risks and uncertainties. Actual results could differ materially from those currently anticipated due to a number of factors and risks. These include, but are not limited, the risks associated with the oil and gas industry in general such as operational risks in development, exploration and production; delays or changes in plans with respect to exploration or development projects or capital expenditures; the uncertainty of reserve and resource estimates; the inability of Point Loma to bring additional production on stream or in the anticipated quantities disclosed herein; the uncertainty of estimates and projections relating to reserves, resources, production, costs and expenses; health, safety and environmental risks; commodity price and exchange rate fluctuations; marketing and transportation; loss of markets; environmental risks; competition; incorrect assessment of the value of acquisitions; failure to realize the anticipated benefits of acquisitions; ability to access sufficient capital from internal and external sources; changes in legislation, including but not limited to tax laws, royalties and environmental regulations, actual production from the acquired assets may be greater or less than estimates. Management has included the above summary of assumptions and risks related to forward-looking information provided in this press release in order to provide security holders with a more complete perspective on Point Loma’s future operations and such information may not be appropriate for other purposes. Well test results should be considered as preliminary. Neither a pressure transient analysis nor a well-test interpretation has been carried out on the well test data contained herein and therefore the data contained herein should be considered to be preliminary until such analysis or interpretation has been done. There is no representation by the Corporation that the disclosed well results included in this news release are necessarily indicative of long term performance or recovery. As a result, readers are cautioned not to place reliance on such rates in calculating the aggregate production for the Corporation or that such rates are indicative of future performance of the well. SOURCE Point Loma Resources Ltd.